Back on track! For anyone who doesn't know what's going on; Every Wednesday I buy comic books. I read them and then blab a bit about them here. I plan to do this for a full year (and then we'll see what kind of mood I'm in). Yes, it's another Hickman joint. No, I'm not obsessed. He just keeps coming up with these crazy high-concept comics and it's kinda hard for me to resist. This time it's a western-sci-fi-Armageddon deal. A sort of alternative universe where people ride headless motorized horses, high-tech cities climb out of canyons, and there are still bloody shoot-outs in bars. Add to that the four horsemen of the apocalypse and you can get an idea of what's happening in this first issue. 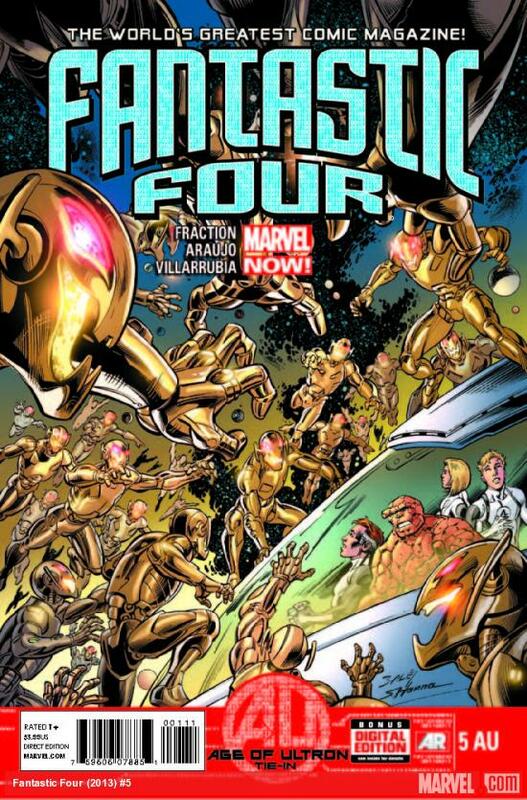 Hickman is reunited with his Fantastic Four partner Nick Dragotta on this and it's a perfect match. I wasn't always happy with his work on F4 but you can tell that this world is more geared towards his style. Frank Martin also does a great job on colour too. They really compliment each other. 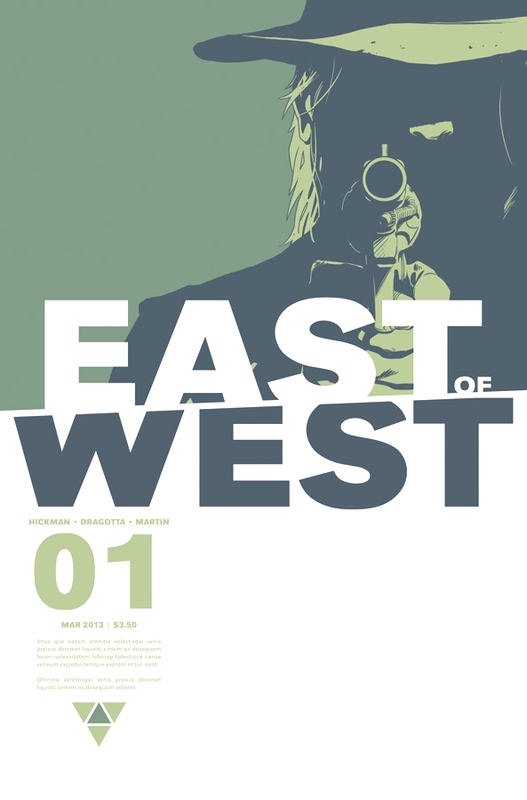 If you like the kind of stories that you'd find in 2000AD, this one is for you. It would fit right in with the rest of Tharg's domain. 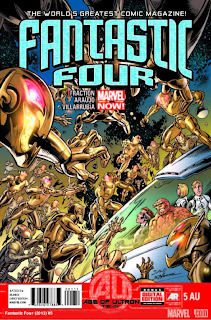 So this is one of those out-of-continuity, special tie-in issues for the Age of Ultron story. Sadly, it's also the best issue of Fraction's run so far and has highlighted my problems with the series. First of all, the art is a million times better than the series' current team. And I'm not just ragging on Bagley again, it's the colourist too. Araujo and Villarrubia are really good on this and I wish they would stay. This is also a more grown-up affair. It's not the fun-for-all-the-family work that the book normally is. People get hurt, things get serious, the kids are frightened. It just feels like a much more satisfying read and it only further confirms my suspicion that this is a series I should probably drop soon. I've given up on both of the Fantastic Four titles. I'm already invested in too many comics to justify buying a series that I'm really underwhelmed by. Yeah, I think I'm one more issue away from dropping it too. I always struggle to drop comics from people whose work I enjoy as I'm worried I'm going to drop out just before it gets good. Tension! Some people just work better with some titles. As much as I love Warren Ellis, I really haven't cared about some of storylines (Astonishing X-Men) and I feel the same way about Fraction. He just isn't the right writer for the First Family. I just wish I could see a better book drawn by Allred.